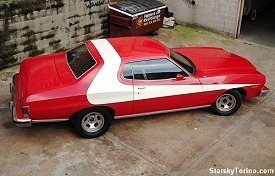 These are, beyond a doubt, the coolest pictures anyone has ever sent me of their S&H Torino. 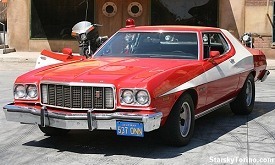 I don't even have pictures of the movie cars that are as cool as these! 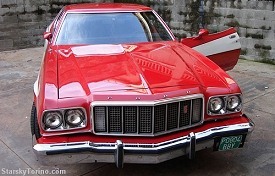 The first six pictures of Ivan's S&H Torino were taken at the Warner Park in Madrid, Spain. The photos were taken for Autobild magazine. 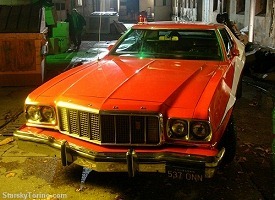 Ivan bought this car from a gentleman in Longham, England in 2006. It was already painted like this, but he has done a lot of work to it - especially to the original numbers-matching engine, a 351 Cleveland built up to 360 CID. 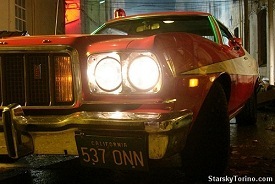 The car is originally from California. Ivan is one of the new generation S&H fans - only 24 years old. 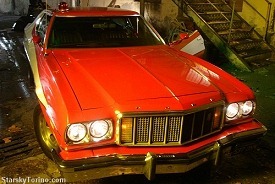 He says he loves the S&H TV Series, and loves American cars. He's a very active member of the American Car Club Catalunya. These two photos of the engine as it looked when Ivan bought the car (left), and as it looks now (right) give you some idea of how much hard work he has put into this S&H Torino. 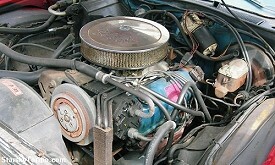 Many cars I've seen look nice on the outside but their engine compartments look like the photo on the left. 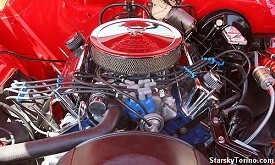 Serious S&H Torino lovers like Ivan take the time to really make the engine compartment shine! 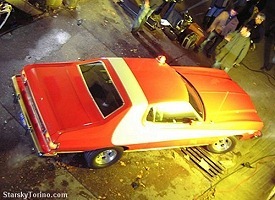 These four pictures were taken on the set of a TV commercial that Ivan's car was used in. Please take the time to click on all of the photos on this page to see bigger versions of them. It broke my heart to shrink them to make them fit on this site - they are so cool! Gracias, Ivan, por compartir su "S&H Torino" con todos nosotros! Created January 22, 2008. All Rights Reserved. 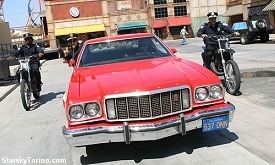 Photos are the Property of the Car's Owner. 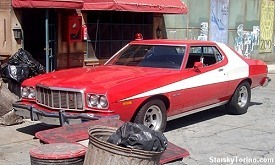 "Starsky & Hutch"® is a registered Trademark and Copyright of CPT Holdings, Inc.
"Ford Gran Torino"® is a Trademark of Ford Motor Company. 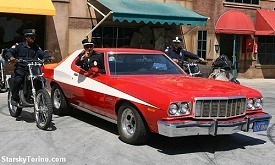 in any car that is not an official Police car is illegal in many states. Check your own State and local regulations!